The Catholic churches of New York offer so many unexpected sights to the inquisitive researcher! Walking toward the eastern end of 14th Street at First Avenue, you see on the north side of the street the phalanx of unprepossessing redbrick apartment buildings that is Stuyvesant Town. To the south is the so-called “East Village,” caught between a Bohemian, if decidedly mixed, past and a gentrified present and future. On the south side of 14th Street rises a romantic, picturesque complex of Gothic-stye buildings executed in brick, including a tower, gables, gargoyles, projecting chapel and a rectory. It the church of Immaculate Conception Parish – a strange but enchanting vision amid the nondescript but fortunately modestly scaled structures that now surround it. But lots had already been acquired in 1853 for a new Catholic church here – Immaculate Conception was one of the wave of new parishes that were springing up all over the island. Dedicated in 1858, within twelve years the church had to be expanded and a school was established. 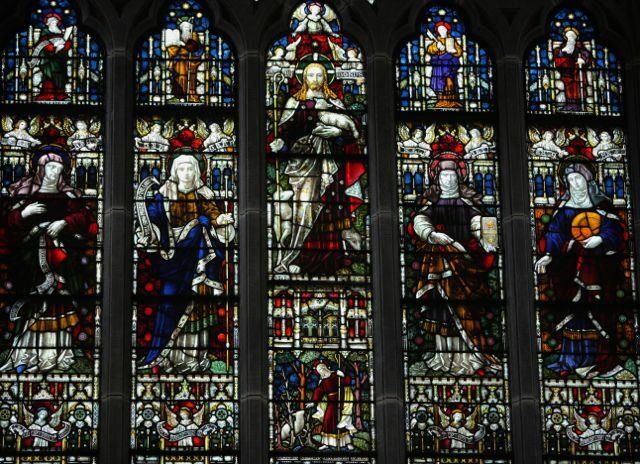 Further extensive redecoration with new altars and windows took place in the early 1900’s. In its exterior appearance the old Immaculate Conception parish was a typical Victorian parish church of that day, with a facade in a kind of Italianate Gothic. We lack images of the interior but judging from the timetable above the overall effect was probably not too different from that of Holy Innocents parish today. The parish bounds included parts of the notorious “Gas House“ district (where Stuyvesant Town now stands), but the 19th century congregation probably was representative of all kinds of income levels, much like old St. Ann’s parish not too far away. The Irish made up the majority of the parish; we read that in 1914 “the basement church for the Italians is in charge of Rev. Joseph A. DeMarco.” 2) The Italians of the vicinity would shortly get their own parish of Mary Help of Christians on East 12th Street. (Above) The old church of Immaculate Conception Parish. 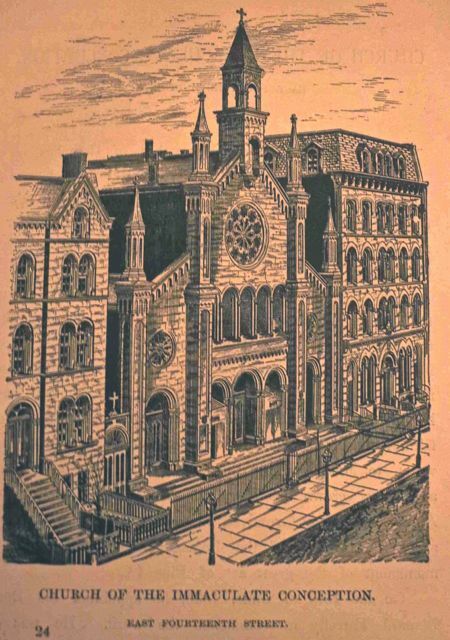 Now in the 1890’s Grace Church, one of the main Episcopal churches of New York City, constructed an elaborate “chapel” at 414 East 14th Street for those who could not afford pews at Grace. The complex also included a hospital, a garden within a courtyard, and even a water fountain on the street (at a time when that might have been more than a welcome convenience on hot days). It was an “outreach program” (as one would call it in the conciliar church of today) to the Protestants of this poorer side of town. 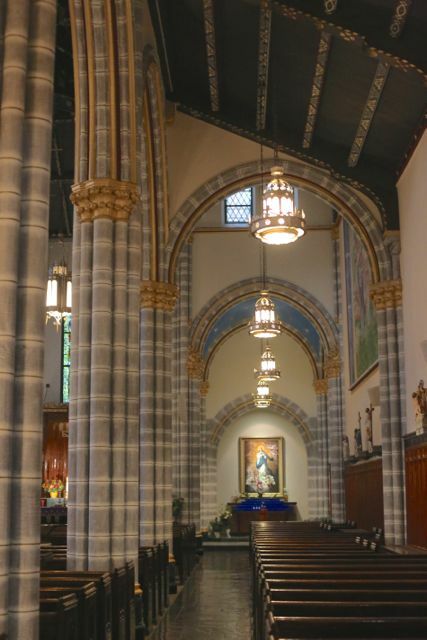 The whole was executed in a late Gothic or “Francis I” style” – intended to resemble that of the châteaux of the Loire, I suppose – but the overall layout resembles that of other “English country” Anglican parishes in New York. Renwick’s Grace Church provided the template: a church, often dominated by a spire or tower, surrounded in romantic disorder by a complex of buildings: a vicarage, schools, chapels, even here and there a cloister. 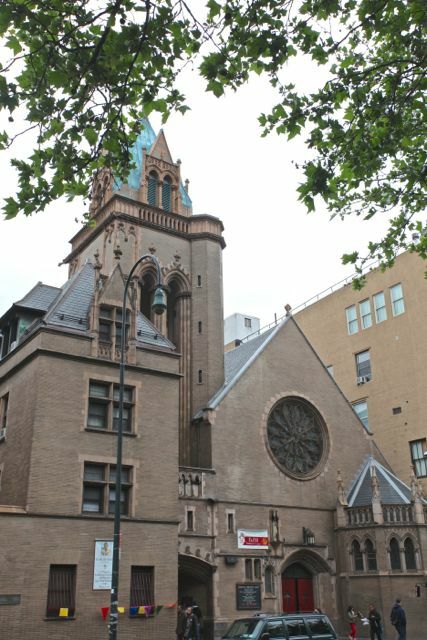 The formerly Anglican, now Catholic Church of St Thomas More on the Upper East Side is another, smaller-scaled example. 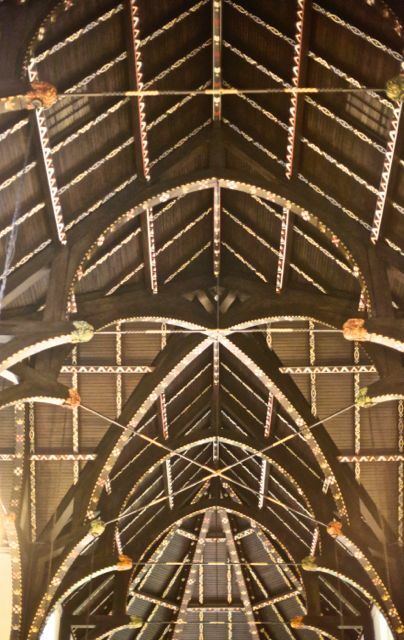 3) The New York Times, in an early review of doings on the Lower East Side, celebrated “Grace Chapel” (as it was known) as the most magnificent effort of ecclesiastical architecture to be found in the entire neighborhood. As the twentieth century advanced the Catholic parish of Immaculate Conception fell on harder times as the neighborhood grew poorer. But then an extraordinary thing happened. In the 1940’s the Metropolitan Life Insurance Company launched a project to build a vast complex in the vicinity: Stuyvesant Town. It was destined to be the last hurrah of the middle class on the island of Manhattan. To build Stuyvesant Town a whole neighborhood had to be razed – including two old Catholic parishes. St. Mary Magdalene – bereft of its now embarrassing patron saint – later was reincarnated in the new St.Emeric parish. Immaculate Conception church also lay in the path of redevelopment. But in the case of this parish, the miraculous took place. 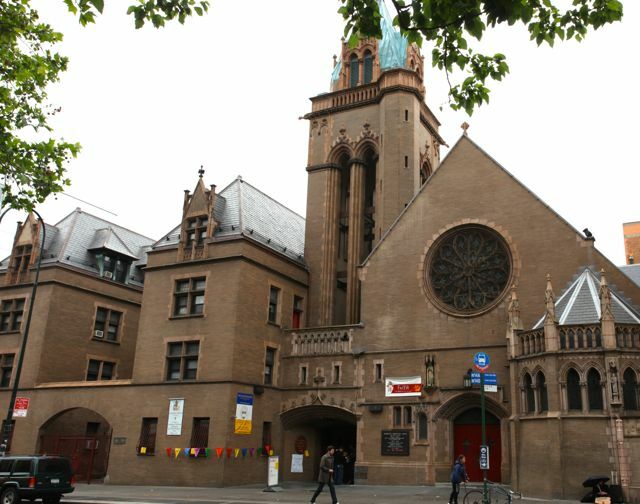 Grace Chapel had been closed by 1943 because of the disappearance of Protestant population in the neighborhood. The entire complex was then acquired by the Archdiocese as the new home of Immaculate Conception parish. So our parish in modern day Baghdad-on-the-Hudson was much more fortunate in its exchange of a new church for the old than was Aladdin’s wife in her dealings with the lamp merchant! As ever, the exterior of Immaculate Conception presents a handsome face to East 14th Street. 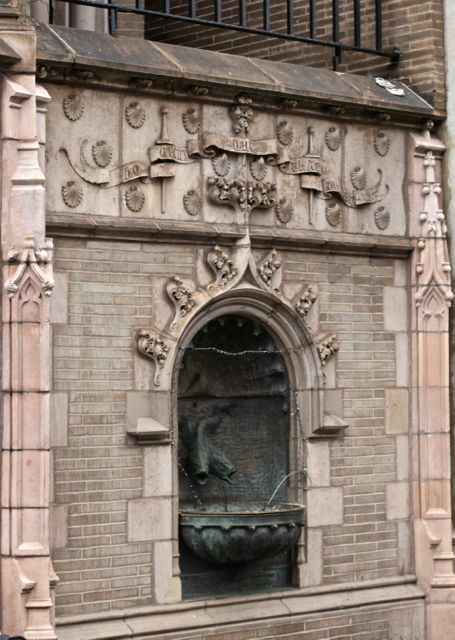 Unfortunately the quaint water fountain remains dry – as seems to have been the case for decades. Indeed there is netting over it now. 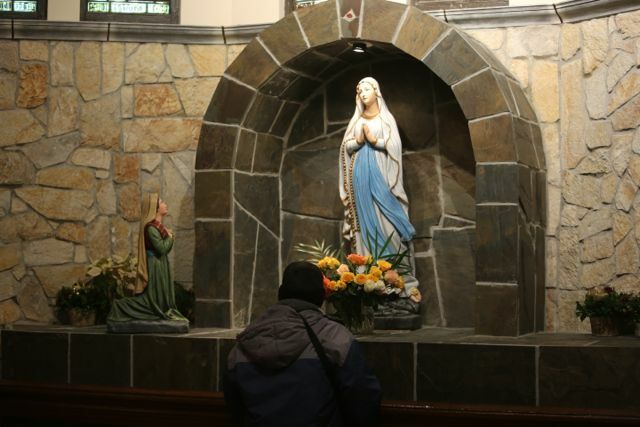 Over the late-Gothic arch leading into the church is a statue of the Virgin taken from the old Immaculate Conception Church. The interior is impressive – high, light and airy – with a splendid wooden ceiling. 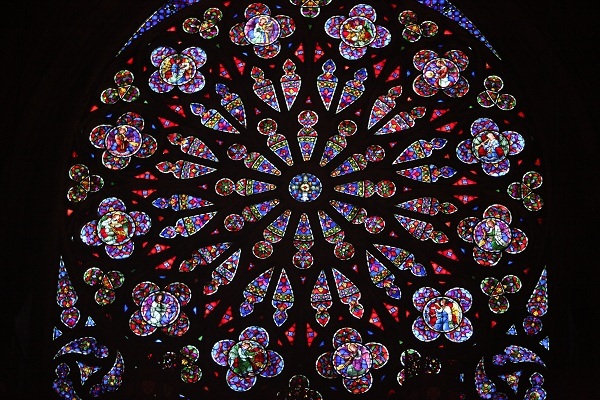 Immaculate Conception is one of the “bright” as opposed to the “dark,” Gothic churches of the city. 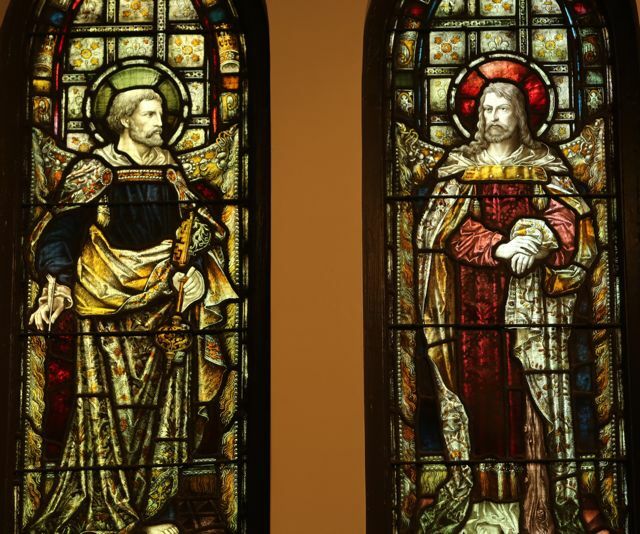 Other than the ceiling, the most impressive decorative feature is the series of exceptional “Protestant” windows, celebrating figures of the Old and New Testaments, including some female personages hardly ever depicted in Catholic churches. (Above) The Redeemer surrounded by Sarah, Deborah, Elizabeth and Salome. 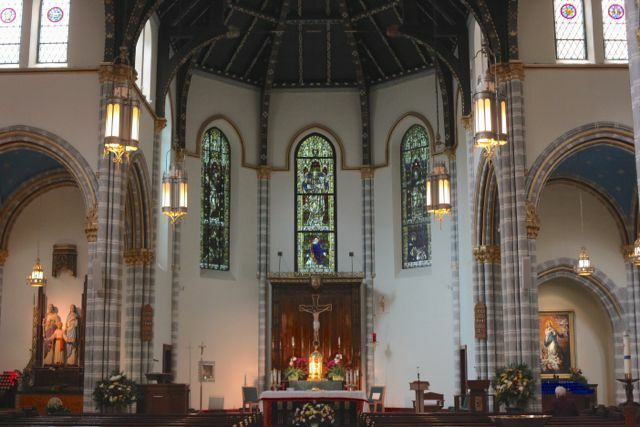 Aesthetically speaking, Immaculate Conception and St. Thomas More – both 19th century Anglican structures – were the two most successful Catholic churches created by Cardinal Spellman in Manhattan. 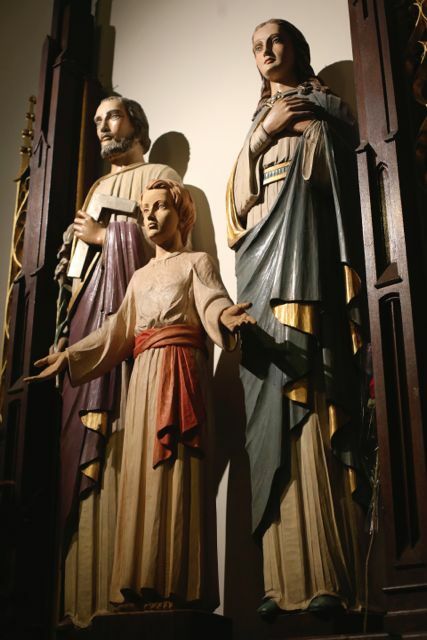 It is hard to get a sense today for the initial Catholic decorative scheme of the 1940’s – this parish underwent an early “conciliar” house cleaning in the 1960’s. 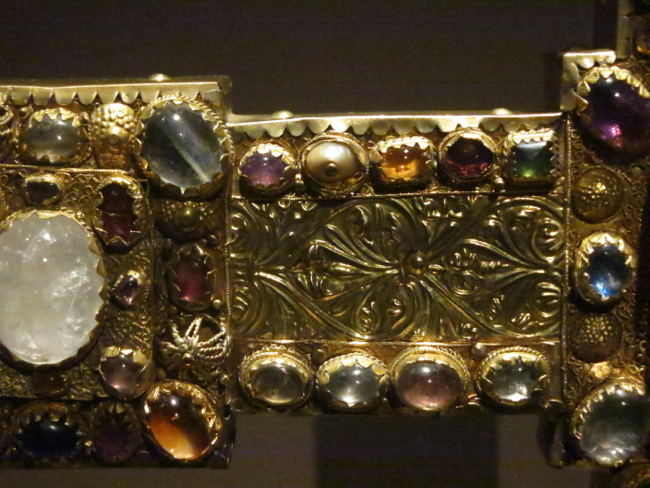 But the original decor seems to have been restrained – already influenced by the Liturgical Movement. 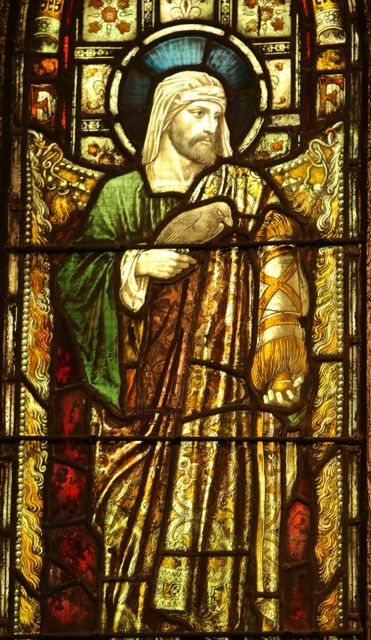 In general, while since 1943 the Roman Catholic Church has added very little of aesthetic value to this church, it has been, except for one outrageous modern mural facing the main stained glass window, nowhere near as destructive as elsewhere. 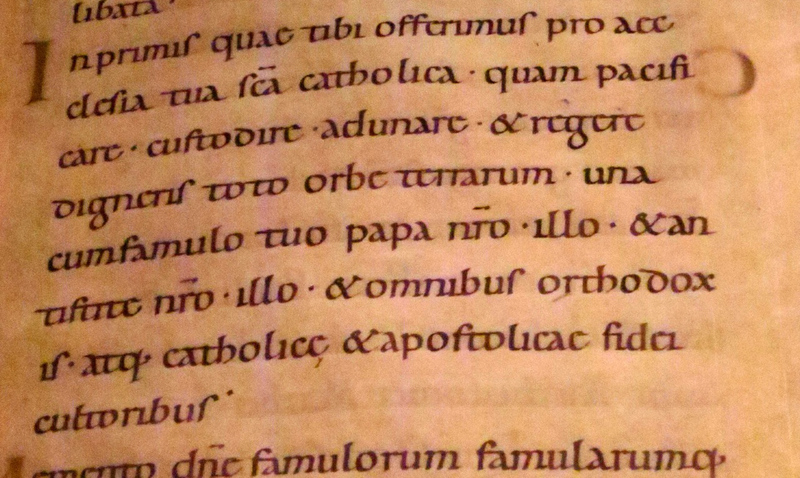 (Above and below) Catholic contributions. Below, the recently restored high altar. (Above) The sides of the church facing the inner courtyard, executed in plain brick. 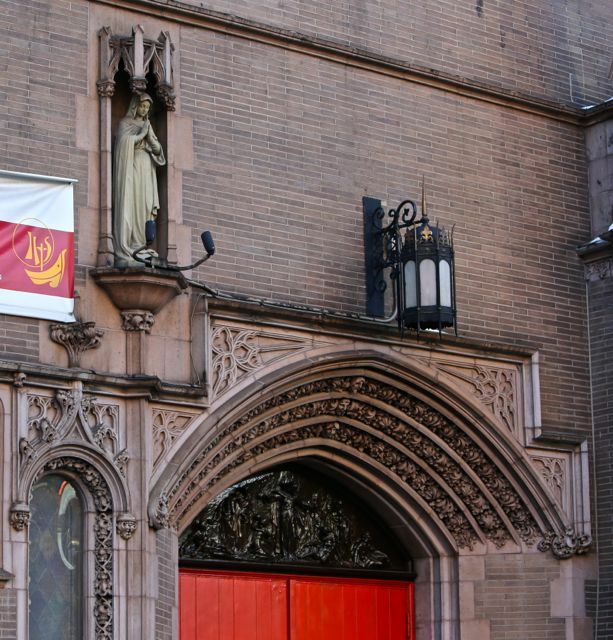 Immaculate Conception has remained an active parish with a functioning school up to the present day, buoyed by the ongoing stability of Stuyvesant Town. It has lived through the vicissitudes of the rest of the neighborhood, however; its southern surroundings in particular by the late 1970’s took a radical turn for the worse, only to rebound- at least economically – under the recent gentrification wave. 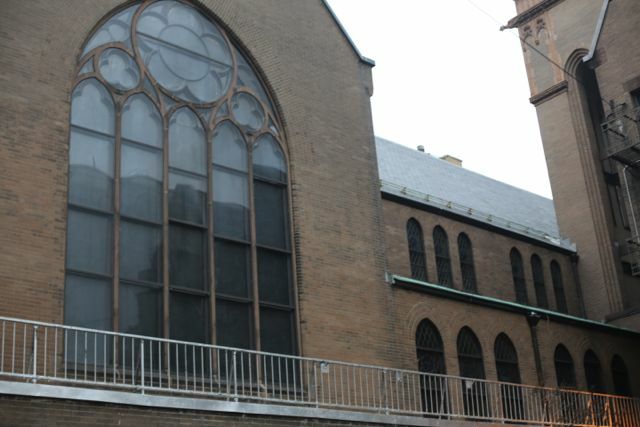 Its neighboring parish to the south, Mary Help of Christians was a victim of this resurgence, recently closed and sold by the Archdiocese to a developer of luxury condominiums. But since this parish was technically merged into Immaculate Conception, that parish’s congregation – and at least some of the money from the sale of its church – ended up in Immaculate Conception parish. 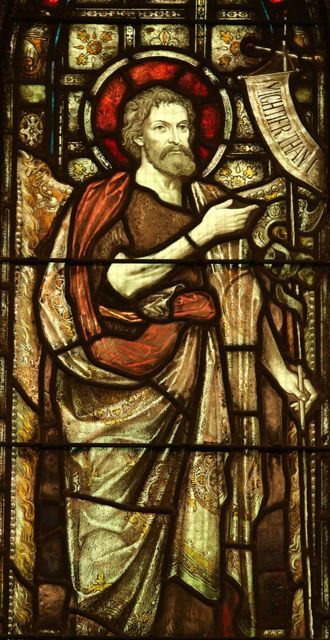 Over the years the maintenance of the parish complex – the roof, the windows – has been an ongoing effort. 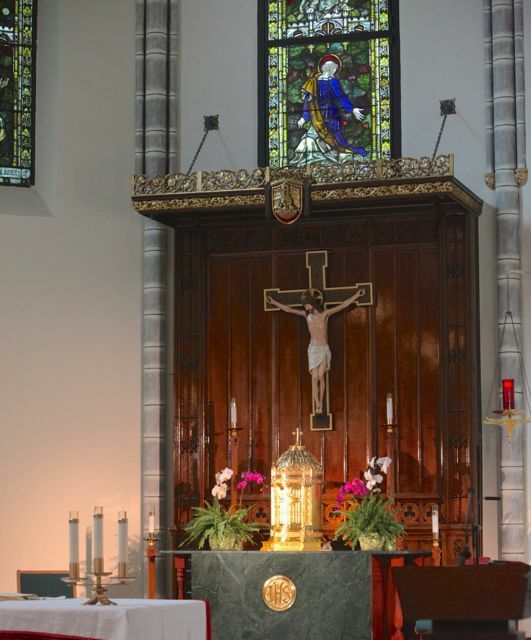 The high altar was recently reconfigured under Cardinal Egan. 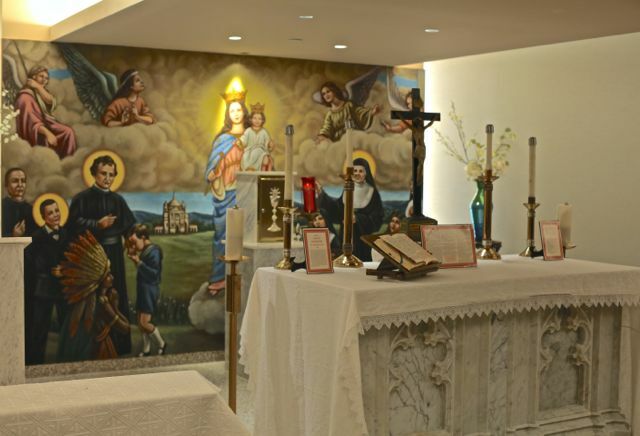 And a new chapel of Mary Help of Christians has been just opened in the basement. It’s Novus Ordo 2014-style:a stark modernistic auditorium adorned with traditional decorative furnishings – some taken, as is so often the case, from another destroyed church. 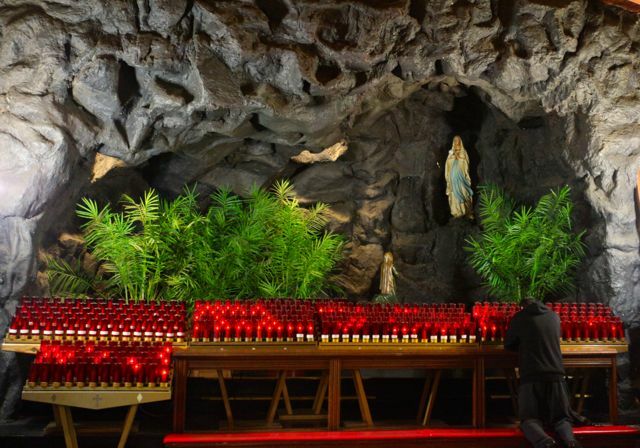 Elsewhre in Immaculate conception church, the most recent restoration campaign eliminated a huge Lourdes grotto, but restored the original baptistery. (Above) The new “lower church” of Mary Help of Christians – named after the closed parish merged into immaculate Conception. (Above) The old Lourdes shrine and (below) its recently installed successor. 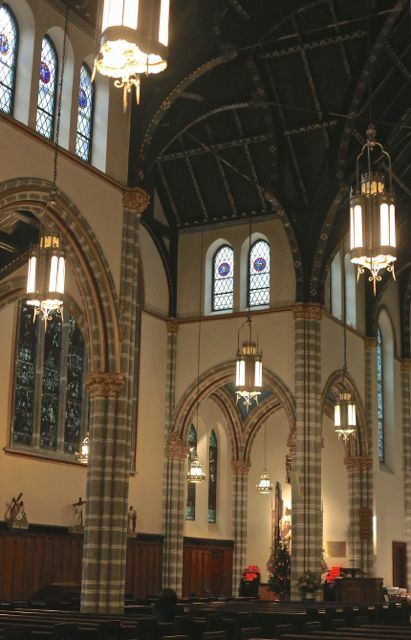 So Immaculate Conception parish perseveres having endured some of the the most amazing twists of fortune – favorable and unfavorable – of any church in the city! Despite it all, for the foreseeable future this parish remains committed to its mission in this part of the city. As one of the last and biggest disasters generated by the pre-2008 real estate bubble, Stuyvesant Town was sold to a financial group which wanted to upgrade the property. Elsewhere in the city such gentrification has not necessarily been a blessing to the local Catholic parish. In the wake of the crash, however, the new purchaser became insolvent. So an element of uncertainty remains over the future of this complex – which in this case may be beneficial for Immaculate Conception parish. The parish has a very informative website.